How to unlock PDF files? The Unlock PDF tool enables you to remove access restrictions from a PDF file. Specify the document password to be used to open and unlock the PDF. Note that in many cases this can be left empty. If the PDF has a lock icon next to it, it means that the password is needed and the operation will fail if the password is not specified. If the unlocking fails you need to come back and specify the correct password. Click "Unlock PDF" to go ahead and unlock the PDFs. You will then be redirected to the download page where you can download the unlocked PDF files once the processing is completed. The file names refer to the original file name (origfile_unlocked.PDF). Simply click on Download to download each file. Note that you need to be logged in with an account to be able to download files. If you do not have an account, you can sign up for one and download your file right away. 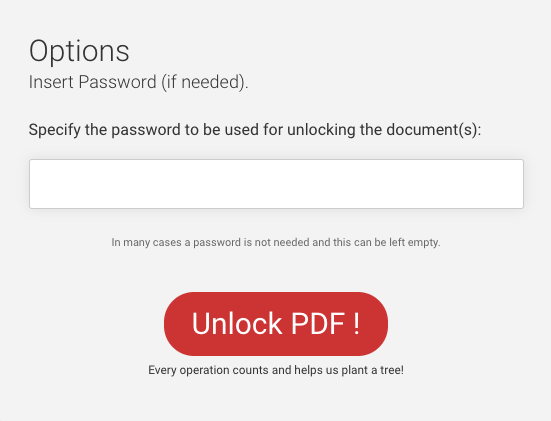 Once you are done, you can click "PDF Tools" to navigate to other PDF tools, or to go back to unlock another file, simply click the Unlock PDF link. If there was something wrong and you need to specify a password, you can use the "Do over" button. It brings you back to Unlock PDF but keeps all the uploaded files in tact, so you can change the pasword without starting from scratch. Note that the Unlock PDF tool supports only removal of standard PDF encryption algorithms. Files with encryption such as DRM, are not supported. I just tried to unlock my PDF but it saids I need a password, what can I do?